Today I want to share with you some insight on Grammarly Premium so that way you can see how you can write an e-book a little bit better. Also, you’ll learn how you can proof it better and how you can improve your blog’s or any writing. That way you will take your writing to another level. If you don’t know English is not my first language. Russian is my first language. I’m telling you that because I want you to know that I had to spend a lot of money on proofreaders and editors to write books, e-books, and content for blogs. Even then they’re not always perfect. All the books and content on blogs do have some mistakes here and there, but people purchase them because of the ideas and concepts the knowledge that they receive from them. What’s important is that they still sell; they still generate income. And by using software like Grammarly premium, you can go ahead and take those books to that next level. You will really improve your writing. Let me show you what this is all about so that way you can see and get a little bit of idea of Grammarly Premium. 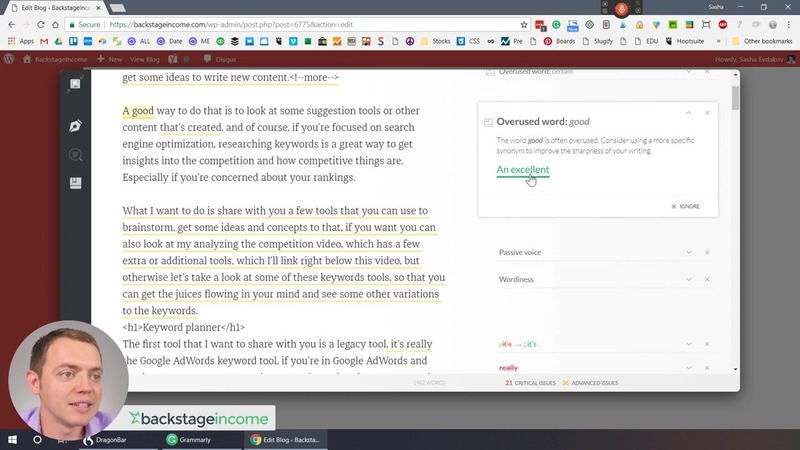 If you put a little chapter in Grammarly, you can scan through, and you’ll notice that there are some regular and advanced corrections. Now Grammarly – the regular version – it’s going to give you only regular correction (anything in red). But, everything in yellow is the premium version. I have the premium version and we use this to go through our content. We’re able to tweak things on our blogs and really make a huge improvement in a really short time. Get there as fast as you can but, still >create< a great product. I could go ahead and say I want to use the word create in this context. Or I could make that change. I’ll skip this correction but then as you continue moving forward you can come across something like this. Again: The word >important< is often overused so let’s just change it to >essential <. You can see that it improves your writing. I could go through this whole chapter and decide what things I want to change and what are the things I don’t want to change. It’s on you. Grammarly Premium gives you enormous options. What’s certain is that all of this is going to ramp up your writing. And you could do this with your book, blog post and it really will just ramp things up. 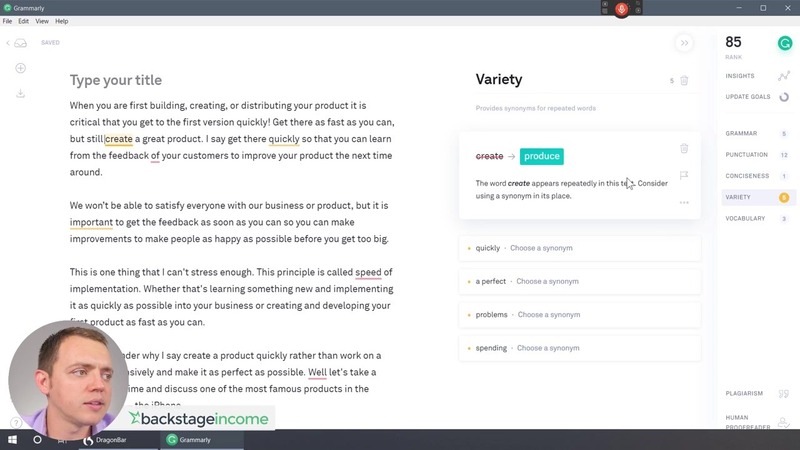 Use Grammarly Premium on a website – Backstage Income website. Let’s take a look at this on our backstage income website. What we’re doing is we create a video and from that video, we extract screenshots and the text that basically is extracted from the closed captioning. We all agree that it’s not written out exceptionally, but what you could do is spend a couple of minutes and edit this blog post. When I scroll down I’ll see this Grammarly suggestion – it gives me 36 and 21 regular problems. Now you could go ahead and open this up, and it’ll allow you to go through things. You can see how this will allow you to tweak your blog post as you’re either writing the blog post from scratch. Or when you are converting a video to an article, this can fine-tune that writing process or speed it up. All of this will speed up that process and maybe if it’s not a hundred percent perfect it’s ok. There is no need to get someone to proofread it four or five times. It might not be a hundred percent perfect, but instead of doing 70 percent, this is the way to achieve that 95 percent level. 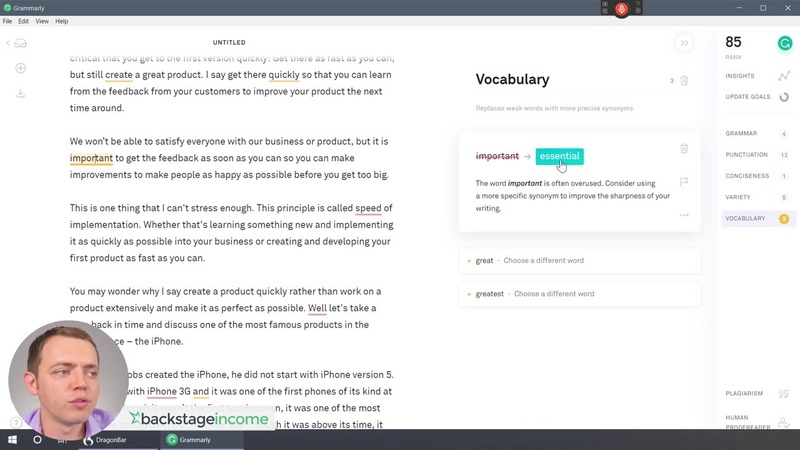 Grammarly Premium will take your content a little bit further and it will make it a little bit better. Use it to take your business on another level without spending an enormous amount of money on proofreaders.